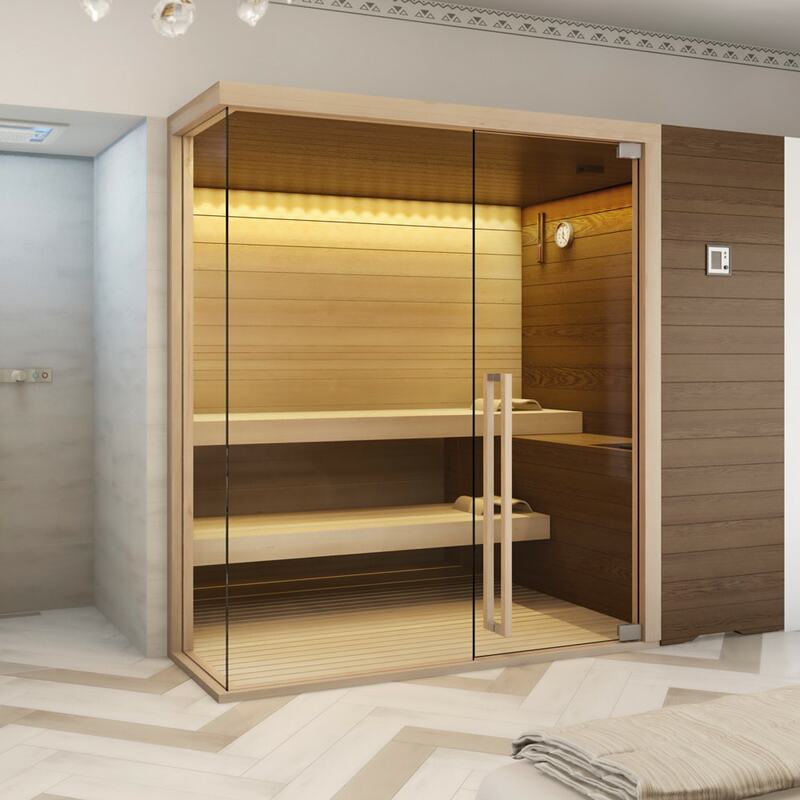 A Stenal sauna lights up every room with the elegance of the finest timber and the brightness of tempered glass, harmoniously adapting to any location, from the most intimate to the most scenic. 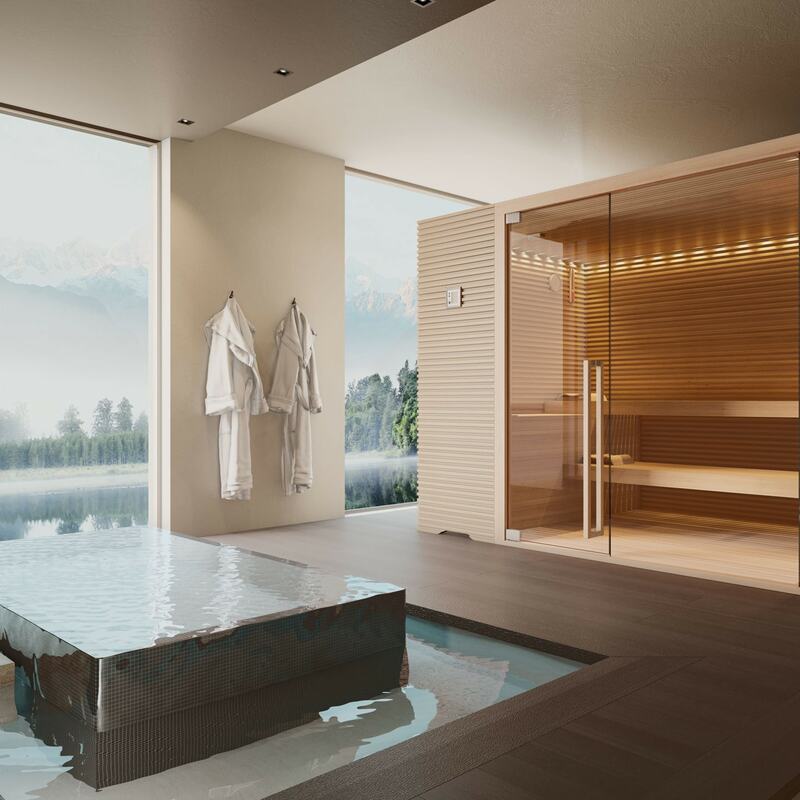 Every creation is customizable according to the available space, and can be enriched with optional accessories such as the Biosauna, which allows to obtain a hot-humid climate, half way between the traditional sauna and the steam bath. 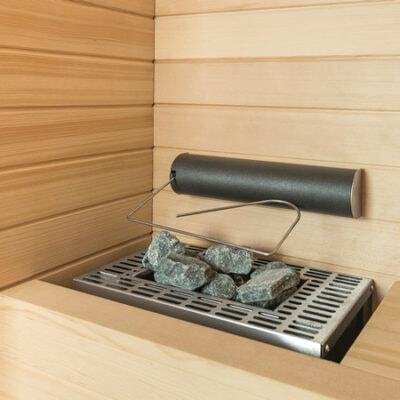 Air circulation in essential to the correct functioning of a sauna. Air must change 6 times every hour, in order to guarantee a healthy and pleasant environment at all times. 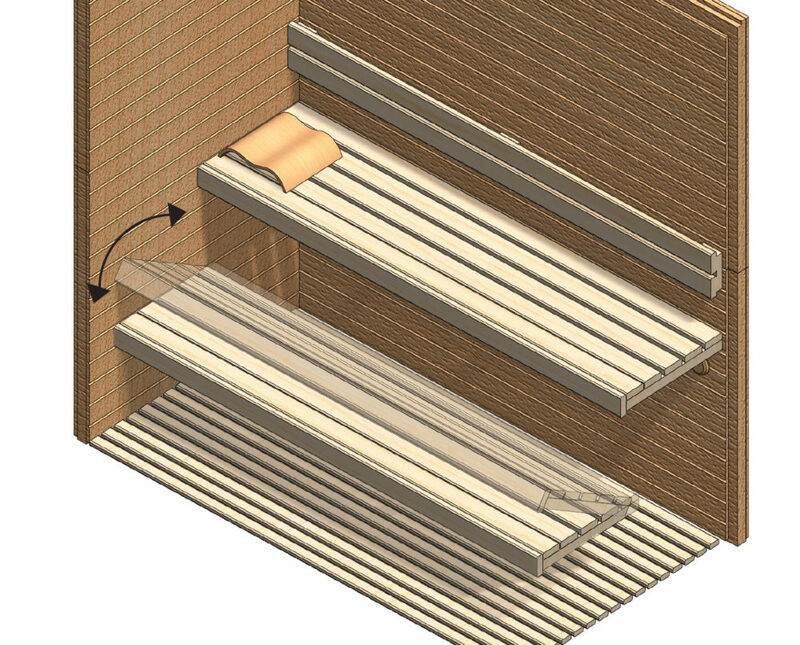 This is why all Stenal saunas are designed taking into account the space into which they will be fitted. 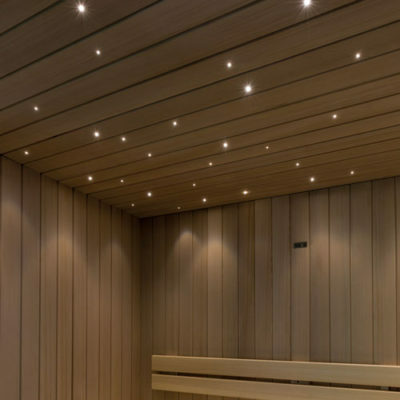 The perfect sauna session is one that you can personalise. 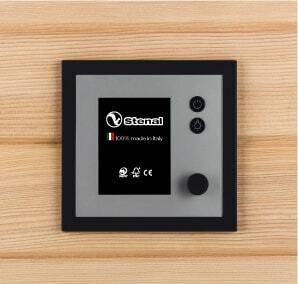 This is why all Stenal saunas have an elegant air flow control that allows to adjust the air flow inside the cabin. 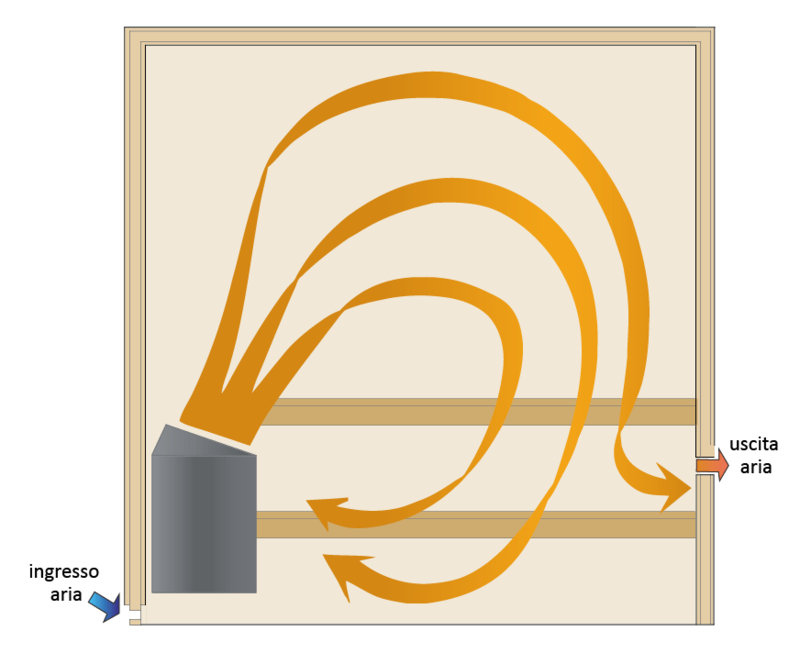 Mineral wool is used as filling, because it provides perfect thermal insulation and is an eco-friendly product. 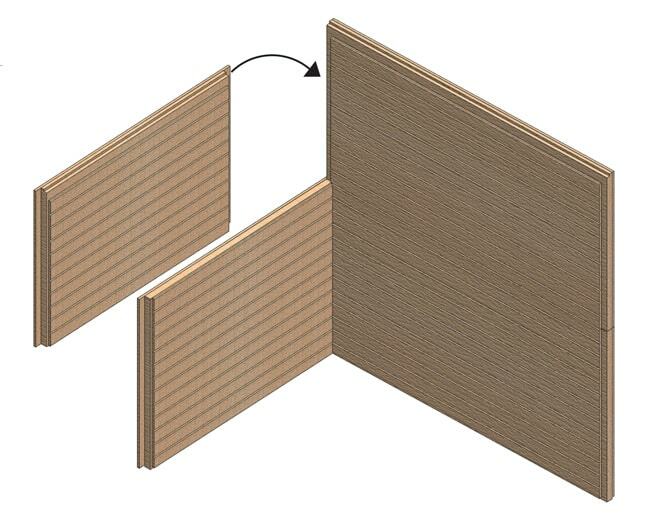 Stenal QuickFIX is a system designed especially to reduce significantly assembling time at our workhouse. 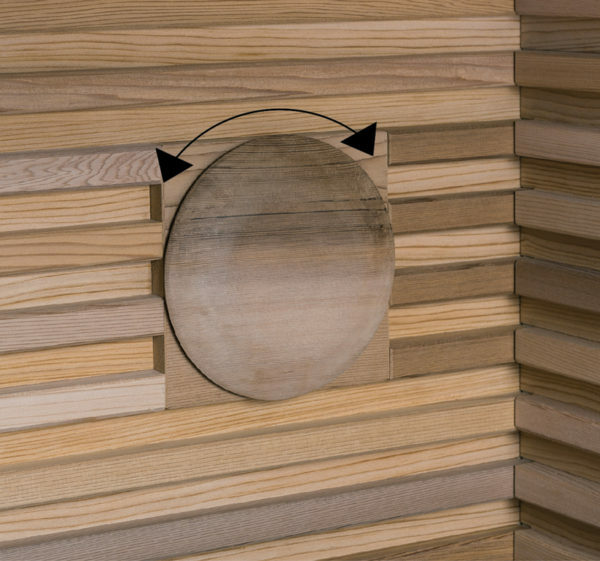 Each component is tested in advance at our production plant so that all pieces can be assembled quickly and univocally to guarantee the perfect fit. 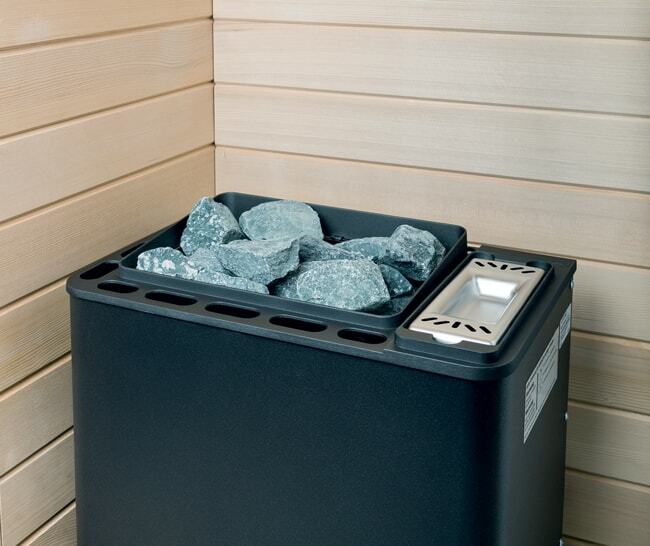 The bench opening system allows to see and reach well inside, to make cleaning all parts of the sauna an easy task. 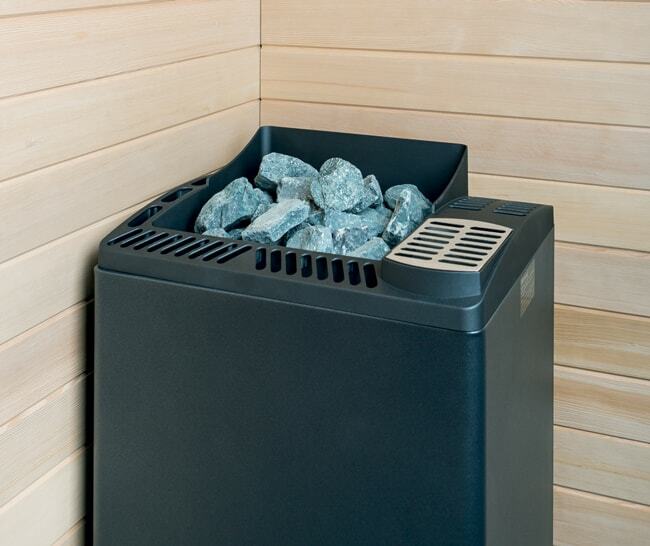 A small-size heater that can contain up to 10 kg of peridotite rocks.Power options: 3.0 / 4.5 Kw. 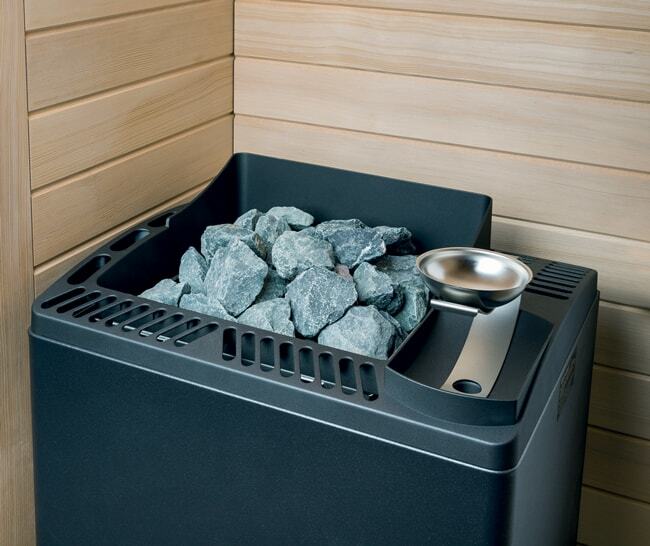 A medium-size heater that can contain up to 15 kg of peridotite rocks.Power options: 4.5 / 6.0 / 7.5 / 9.0 Kw. 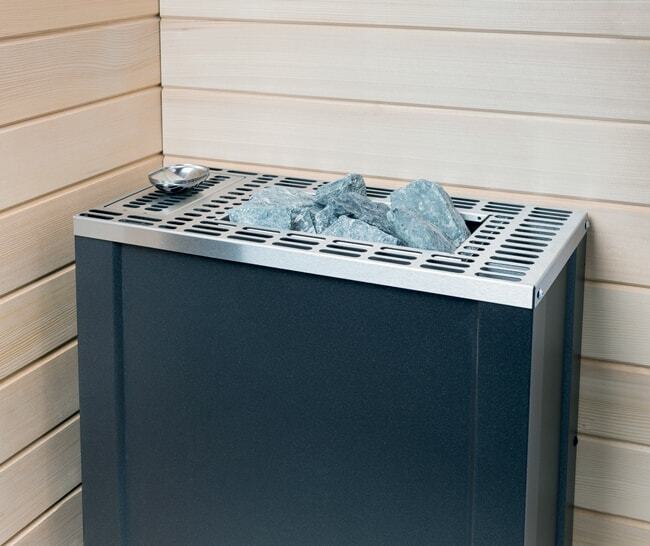 A large-size heater that can contain up to 60 kg of peridotite rocks.Power options: 12.0 / 15.0 Kw. 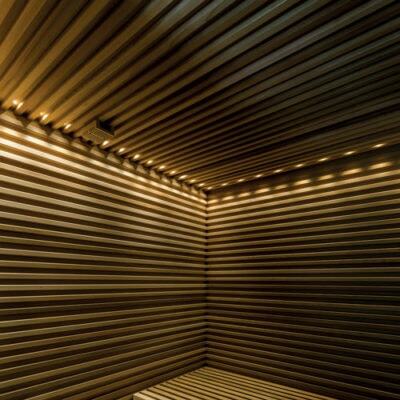 In an environment devoted to body and mind relaxation, light plays an essential role: warm white spot lights along the perimeter of the ceiling bring light, warmth and style to the sauna and emphasise the quality of the materials. Multiple tiny tone-changing spot lights fitted in the ceiling to create unique light effects, with the option to control the colour settings and personalise the mood. 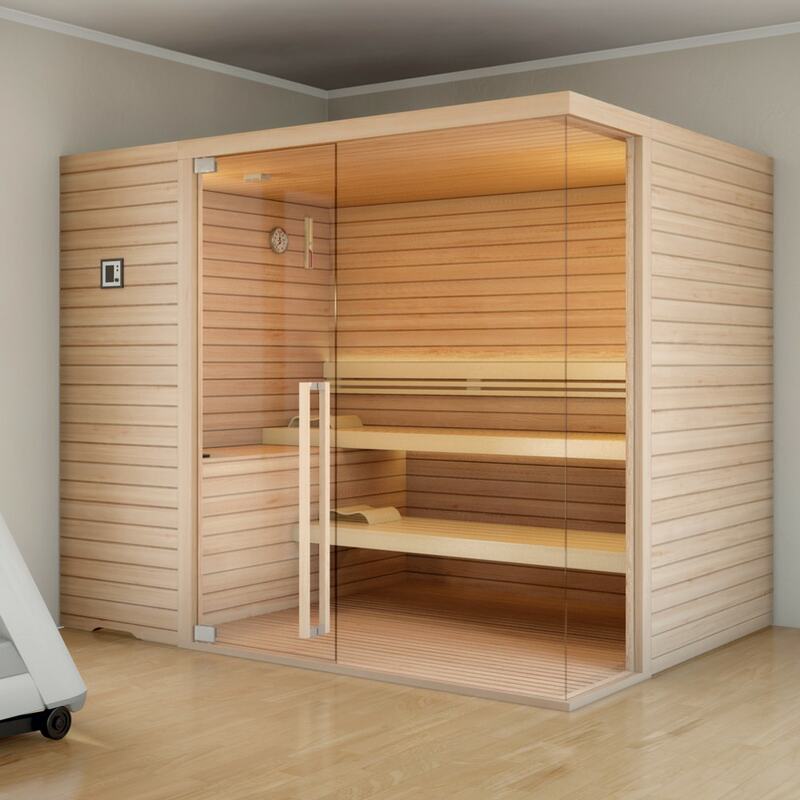 The extremely quiet lighting system ensures a relaxing atmosphere to fully enjoy the comfort of a Stenal sauna. A constant and homogeneous light behind the bench backrest projects a soft, indirect light on the ceiling emphasising the texture of the materials and three-dimensional shapes. The down-facing lights create a evocative and suggestive effect. 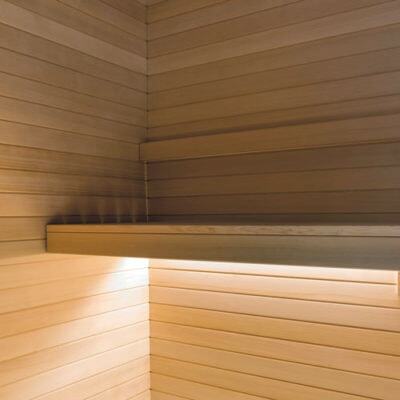 The indirect light endows the sauna with quiet intimacy. Features: Manual and remote activation with timer and week calender. Two lights on/off. LED RGB lighting system, where available. Safety temperature limiter. Automatic cut-off system with 6/12-hour settings. 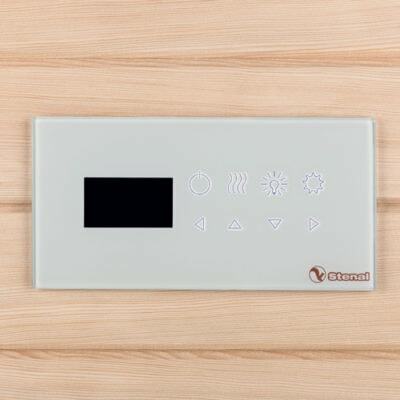 Compatible with home automation systems.Size: 20x10 cm. 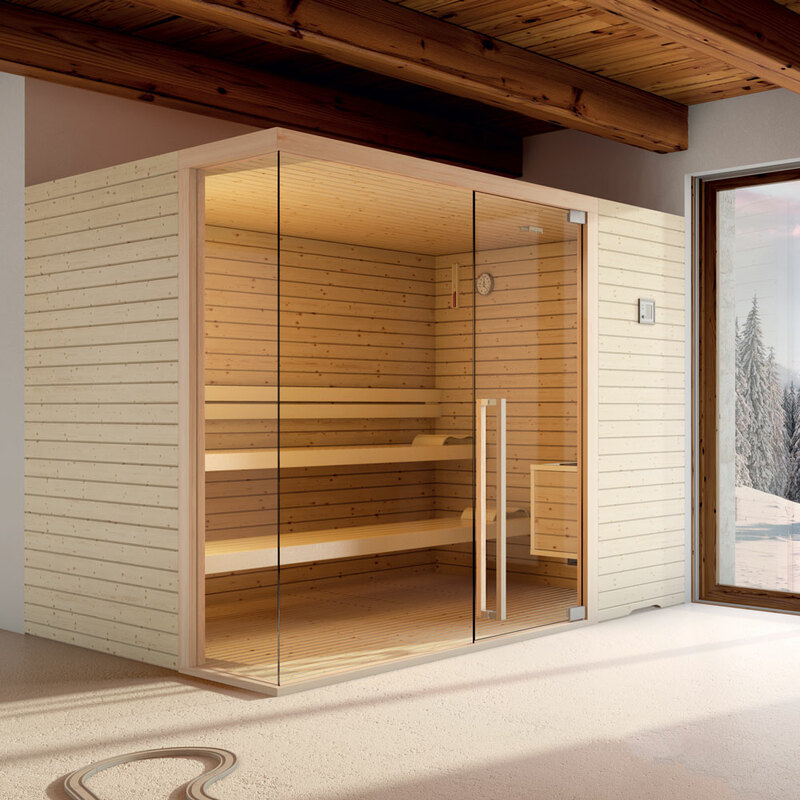 An additional device that allows to use the cabin in two different ways: as a classic Finnish dry sauna or as an intermediate option, half way between a sauna and a steam bath, in which temperatures are lower and humidity levels higher. 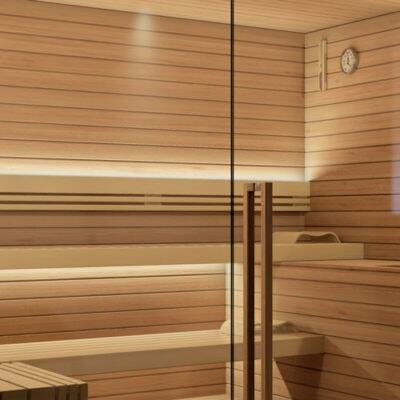 Essences play a very important role in saunas: through smell, one of our most developed senses, we perceive pleasant, stimulating and relaxing sensations. 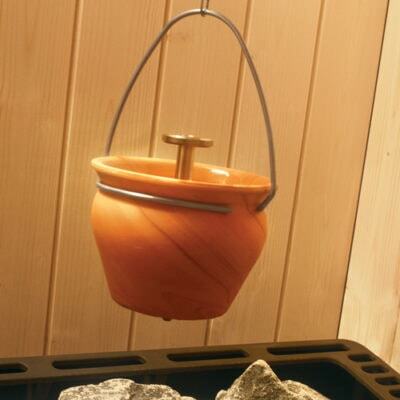 The fragrance drip-doser releases exotic and balsamic aromas for the ultimate sauna experience. 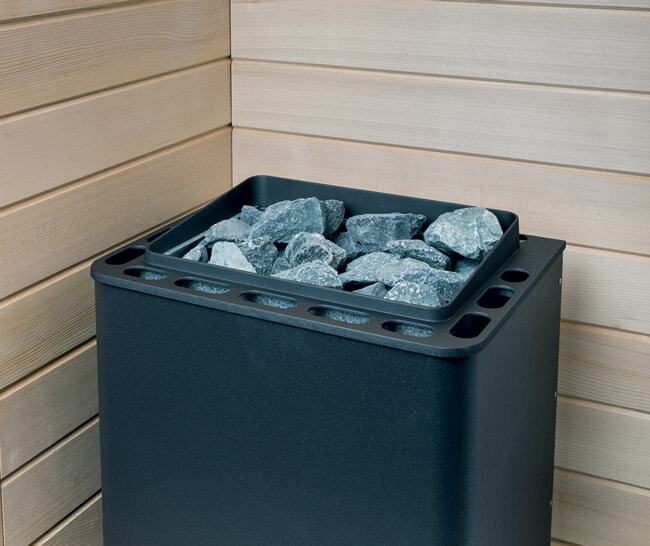 The traditional wood bucket and matching ladle, used to pour water scented with balsamic essences over the rocks to immediately increase the humidity in the cabin. 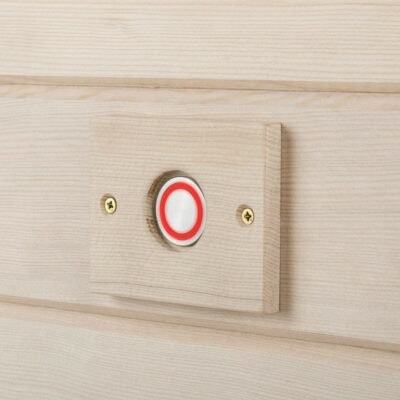 A sauna temperature and humidity indicator with a brand new design, specific for high temperatures. The hands indicate the temperature between 0°C and 120°C and the percentage of humidity between 0% and 100%. An hourglass that measures fifteen minutes in five minute increments, resistant to high temperatures. 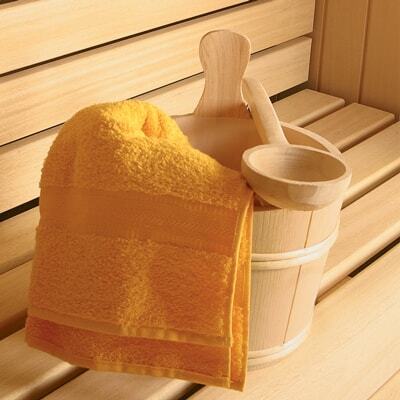 An ideal addition to the line of sauna accessories. 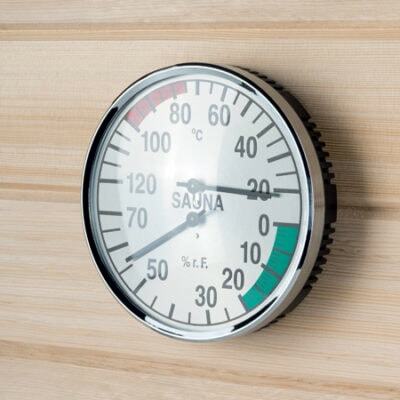 With its elegant wood frame, it hangs on the wall and matches perfectly the style of the best Finnish saunas. 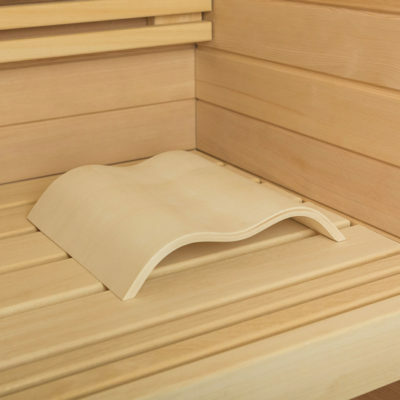 The ideal sauna headrest for total relaxation; a traditional accessory with a modern design that provides a correct and comfortable back and neck position and makes the sauna session even more enjoyable. A button that can withstand high temperatures; must be connected to an external signal (not provided). 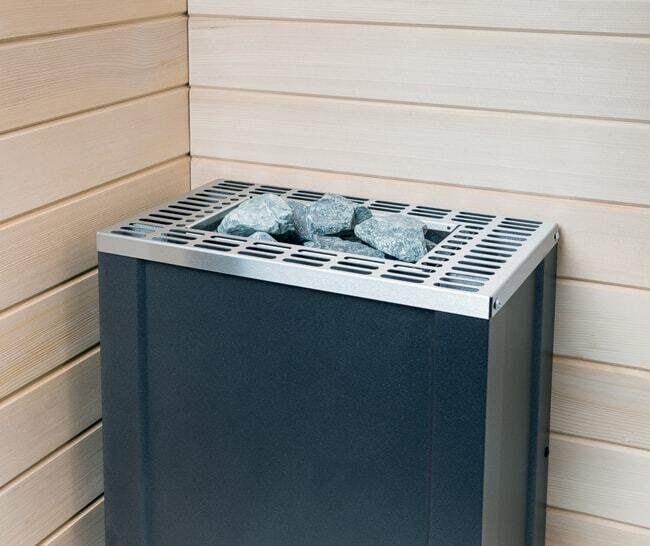 The sensor prevents the heater from switching on if any objects are placed on the rocks, or if towels are in contact with it.